Hi there!! Welcome to another fun week of Jaded Blossom Sneak Peeks! These sets are so much FUN!!! You are going to LOVE them all!! Today we are sneaking peeks from three sets: Curly Label, Curly Everyday Label, and Milk and Cookies! Super cute sets for sure!! I used the set Milk and Cookies today! Its a cute set and can be used for SO many fun cookie parties! The milk carton is from the Silhouette store! Make sure you check out more inspiration from the rest of the Jaded Blossom DT! Stop by tomorrow for another peek! Love how you used that cookies as a background stamp for your treat holder. So cute! 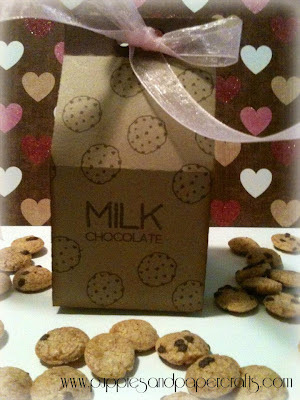 Love the cookie stamp on the kraft cardstock. Love you Milk Carton! The cookies look awesome stamped all over it!